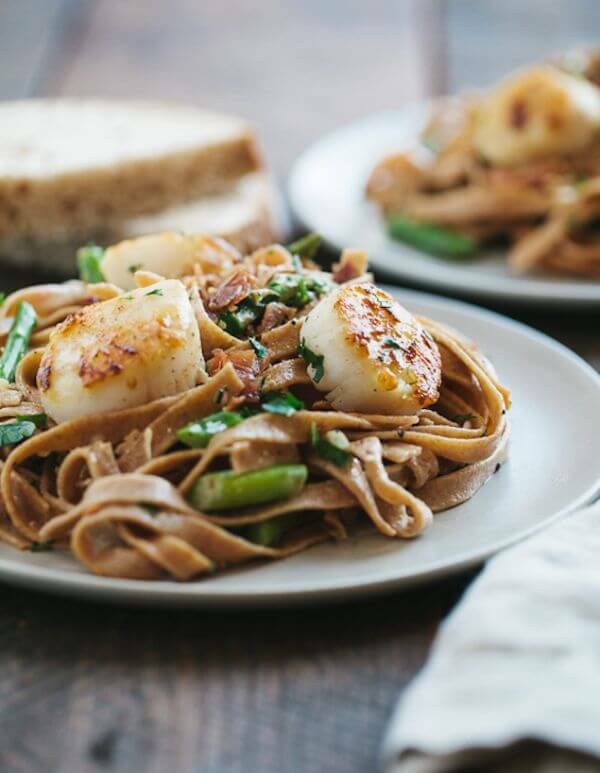 It’s hard to beat the taste of succulent, savory scallops and there’s something for everyone in these 20 quick and easy recipes. 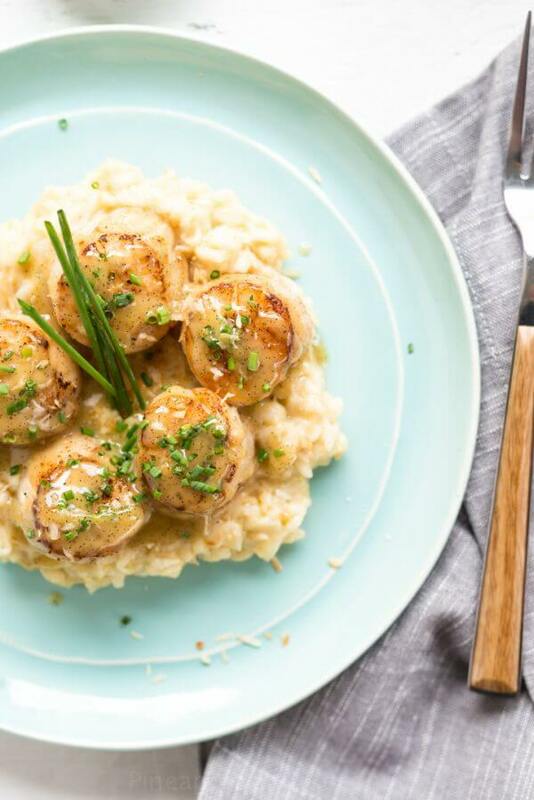 You don’t have to go to an upscale restaurant to enjoy tender sea scallops. It takes less than 30 minutes to make most scallop recipes, and they can be seared, sautéed, grilled, or baked for a quick dinner. They can be made into a light ceviche or healthy salad and pair nicely with a variety of ingredients ranging from chicory to lentil. If you want them to be perfectly sweet and buttery, keep an eye on the stove or grill so you can nail the timing. When done, the scallops will be opaque and breaking apart slightly along the edge. A fork should glide right through the scallops, which is a sign that it’s time to dig. 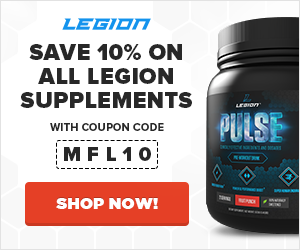 Don’t be intimidated by the sound of fancy flavors in the name. 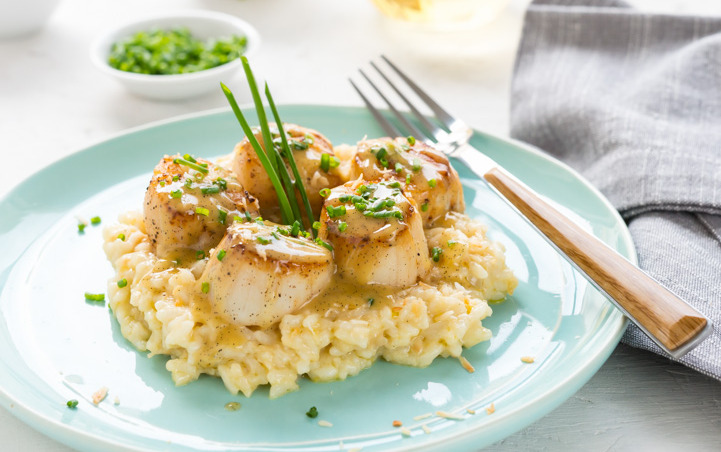 Instead, focus on the pairing of seared scallops and creamy risotto that you could be having for dinner. And since the combination of vanilla, lemon, and coconut is a bit extraordinary, this makes a great plate for special occasions or date nights. If you aren’t shooting for an over-the-top meal, though, you can skip the risotto to slash the total fat content in half. Cooked over a high heat on the grill, it’s a cinch to make scallops that are seared on the outside and tender on the inside. They pair well with just about anything, including grilled asparagus or skewered veggies. For a gourmet accompaniment, this salad of citrus segments, creamy avocado chunks, and grilled lettuce provides an exploration of textures and bright flavors. Everyone at the table will be happy when dinner is smothered in this cream sauce. It has white wine for class and depth of flavor, plus bacon for to satisfy serious carnivores as well as intense umami cravings. But this dish isn’t all about gut-busting ingredients. To go along with the lean and healthy scallops, there’s also a handful of baby spinach for good measure. 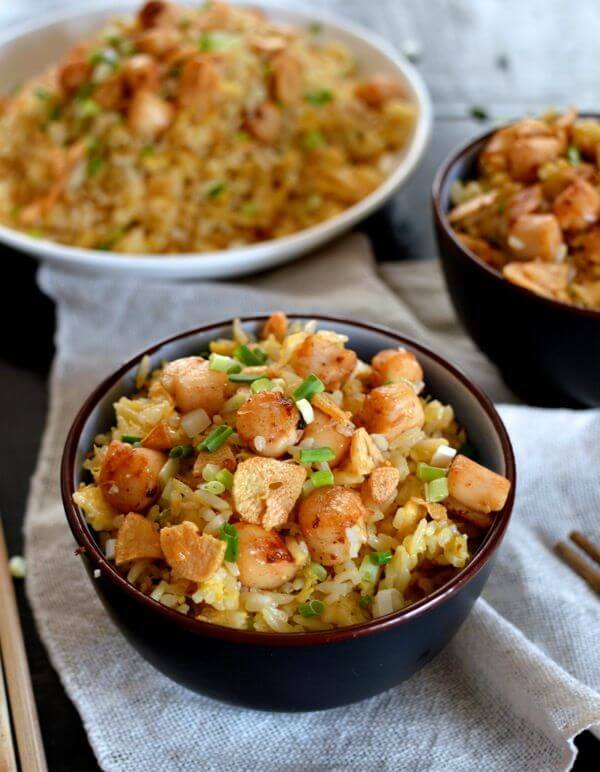 If you’re making a quick seafood fried rice for dinner, you’d probably reach for shrimp. But adding scallops instead will take this ordinary one-pan dinner to a whole other level. The recipe does call for XO sauce, which is hard to find outside of Asian grocery stores (and Amazon), but once you get a bottle, it’ll be gone fast because you can use it in place of fish sauce. XO sauce contains a mixture of dried shrimp and scallops, plus chili pepper and other spices. This winter salad can be served as a light lunch, or divide the portions in have for a seasonal starter. You’ll find the combination to be a unique mix of bitter yet slightly sweet flavors: chicory, olives, pomegranate, and grapefruit. It sounds a bit odd, but the arrangement is carefully put together in the way only a chef can. 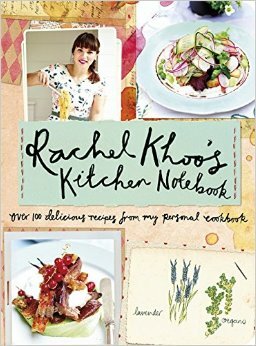 So it’s no surprise this is just one taste from the woman behind bestseller The Little Paris Kitchen and new release Rachel Khoo’s Kitchen Notebook. Cooked in a one-pan meal, scallops can soak up a whole lot of flavor. That’s part of the beauty of this paella – that and it only takes a half hour from start to finish. Not only does the rice dish have scallops for protein, but there’s an equal amount of sausage. 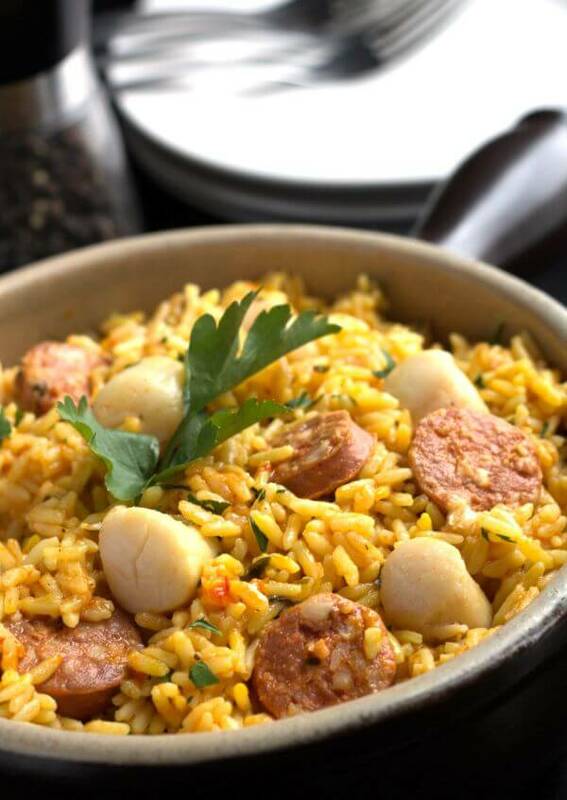 The chorizo adds spice, although there’s also saffron and smoked paprika in the paella to create a rich yet homey flavor. When you can’t decide which kind of protein to cook up for dinner, there’s always surf ‘n’ turf. A thick slab of steak can use a “side” of lobster tail, prawns, or any filet of fish. However, scallops just might outdo them all. 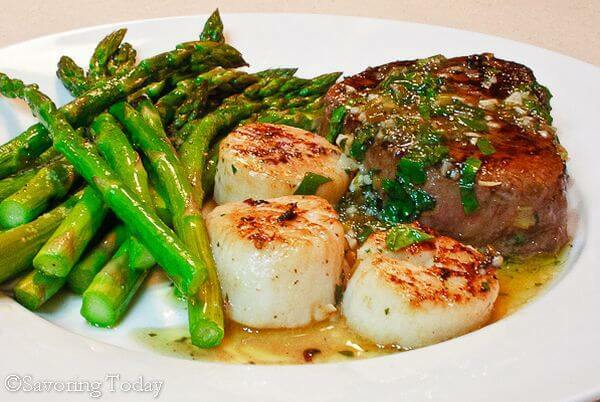 In this recipe, both the steak and scallops are seasoned like scampi. And everything will be ready in 30 minutes! 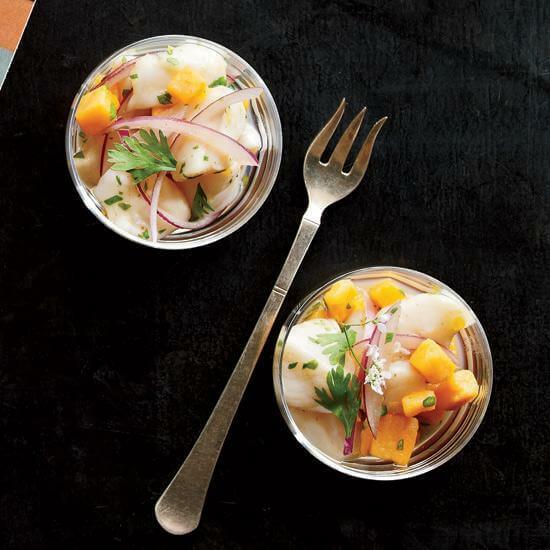 If you love shrimp ceviche, you’ve got to try this twist with scallops. 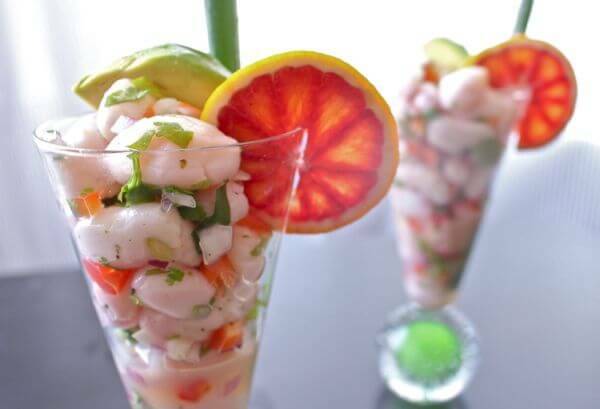 Scallop ceviche incredibly easy to make, although it presents like a restaurant appetizer. And it tastes like one too because the unusual combination of scallops and blood orange is divine. Of course, if you can’t find any blood oranges, another variety will work instead. If you don’t like spaghetti sauce, that doesn’t mean you’re stuck with alfredo when it comes to pasta. Try this flavorful dish with curry, cayenne, garlic, ginger, and coconut milk. 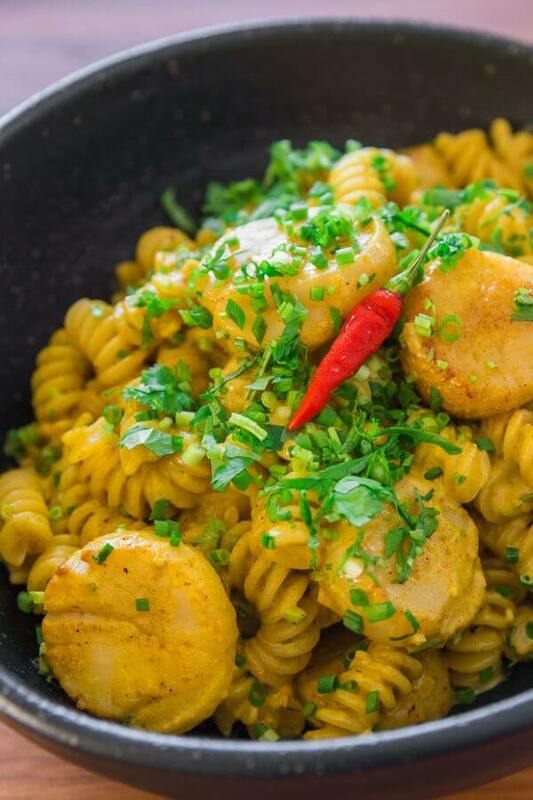 The bowl of rotini is topped with scallops and fresh cilantro. It’s curry; it’s pasta; it’s fresh seafood. What more could you ask for in a quick dinner for two? 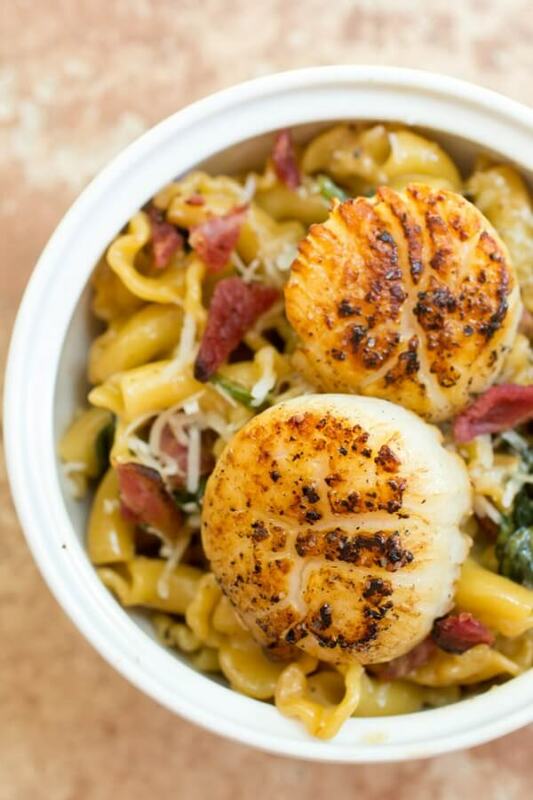 Sea scallops instantly add a coastal touch to an ordinary plate of pasta. Then again, this dish is not exactly typical Italian fare. Instead of marinara or pesto, the spelt pasta is tossed with white wine and cream. There’s also a touch of spring thanks to crisp fresh asparagus. The sweet, buttery scallops and salty prosciutto top it all off with protein and style. For this Italian seafood dish, the scallops and shrimp simmer slowly in the sauce. Called a rose, it’s just a mixture of tomatoes and heavy cream with a dash of crushed red pepper. Meanwhile, the pasta is prepared in boiling water. Everything in this dish comes together effortlessly, so dinner will be done in no time. Unless you’re used to eating South American food, chances are you haven’t had mofongo, a vegetable mash similar to mashed potatoes. Yucca root, aka cassava, has antioxidants called anthoxanthins, which are known to reduce risk of high blood pressure and heart disease. Green plantains, although they look like bananas, have more complex carbs than their yellow-peeled cousins. And both are great sources of potassium. 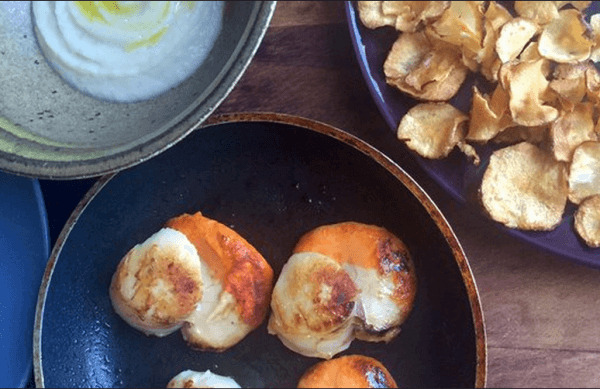 If you’re feeling timid about searing scallops over high heat, here’s an alternative that takes the guesswork out of cooking them to their most tender. And like many one-pan scallop dishes, it uses cream and white wine, so you don’t have to miss out on that timeless flavor combo. Maybe the best part of these baked scallops is being able to prep them ahead of time and finished a half hour before serving. 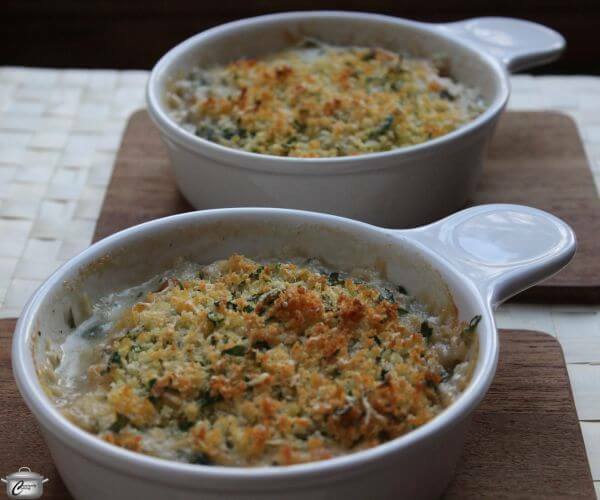 Take baked pasta to a whole new level by adding succulent scallops. This Italian seafood dish is simple, yet will have your family raving that you’ve gone gourmet. 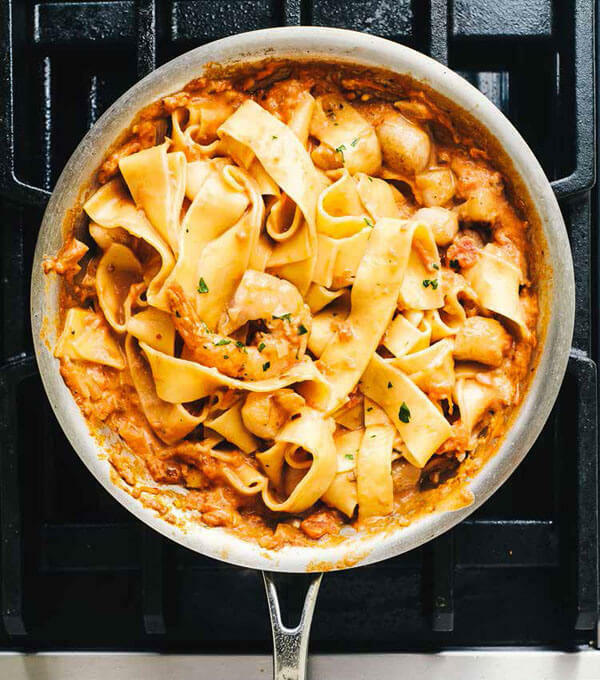 Of course, you can opt to make the spaghetti sauce and cheese tortellini from scratch if you want to spend the day in the kitchen. 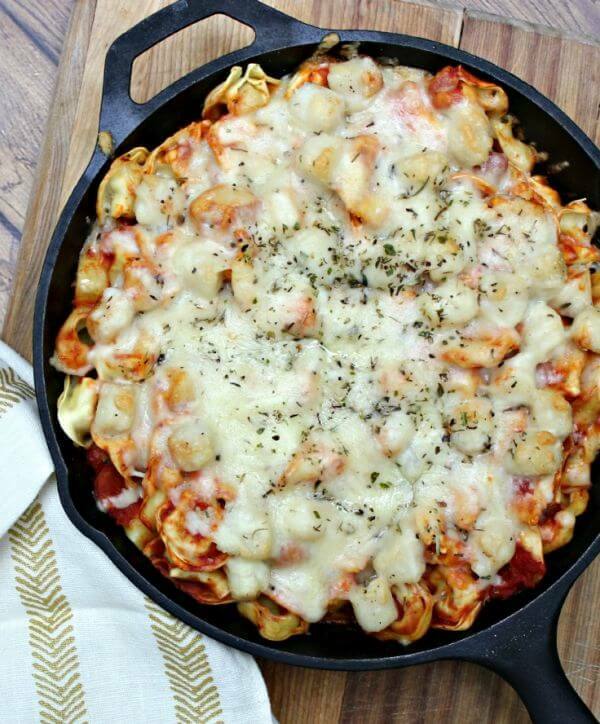 Or, pick up frozen tortellini and a jar of tomato sauce so that this meal comes together in a snap. Since scallops are naturally fat-free, there’s no reason to hold back on what you add to the main protein. 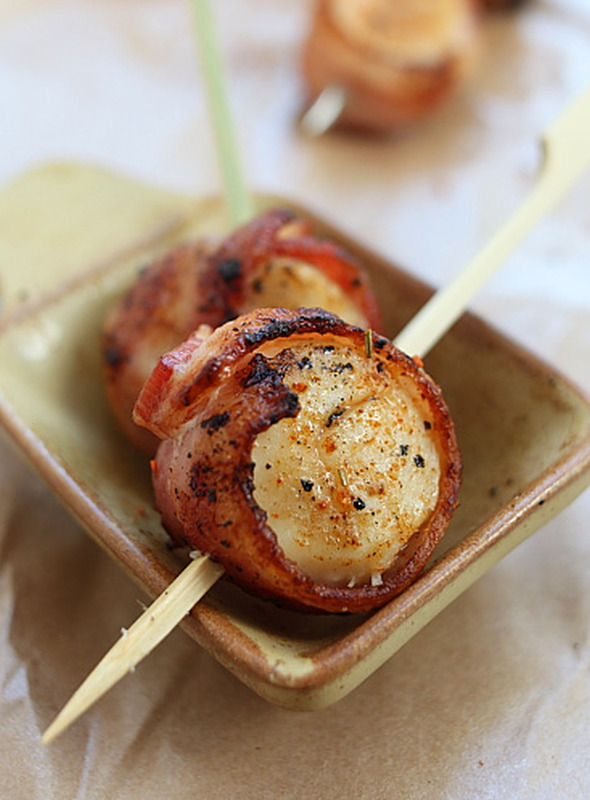 Maybe that’s why scallops wrapped in bacon are so popular. If you ask me, though, it’s probably due to the pairing of flavors and textures. They’re like opposites coming together to form the perfect appetizer – especially if you are having them before a thick, juicy steak. Since scallops have a light, slightly sweet flavor, they taste excellent with a robust spice like curry. 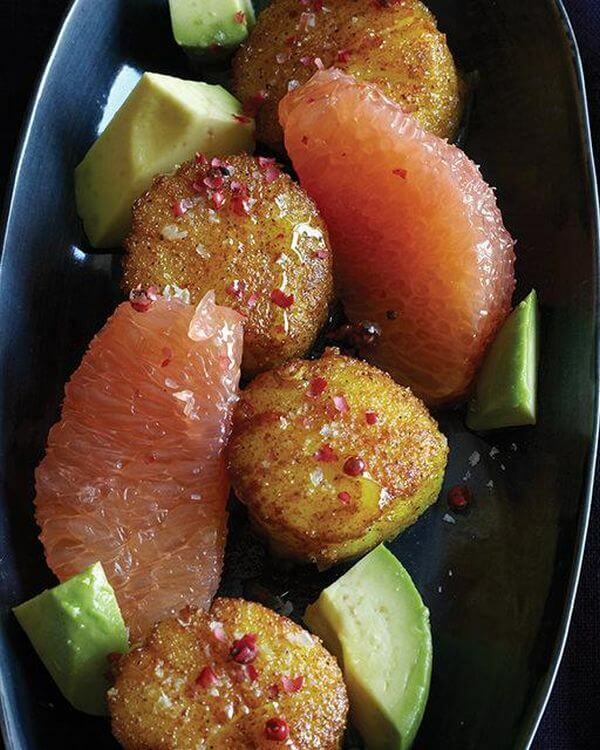 The depth of flavor is offset by the tartness of grapefruit, as well as the mild and creamy avocado. Best of all, these scallops cook up in just a minute. So this dish will be ready as soon as you prep the ingredients and heat up the pan. 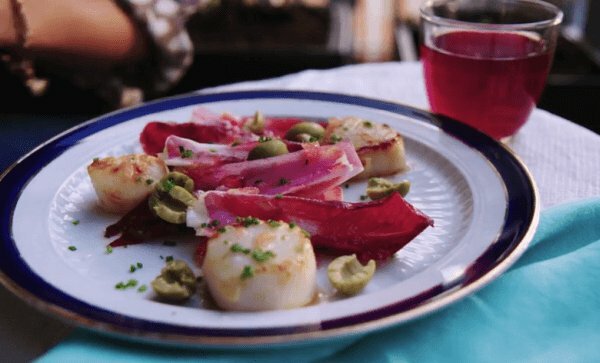 This sophisticated scallop appetizer was created by celeb chef Marcus Samuelsson for an episode of The Taste. Of course it’s delicious, but it’s pretty complex for everyday dining. If you want to enjoy his sophisticated global flavor combinations while relaxing around the dinner table, you need his cookbook Marcus Off Duty: The Recipes I Cook at Home. It includes sections on street food, playing with fire, and cooking with kids. Due to their subtle seafood flavor, scallops can be a canvas for the interplay of two softer elements. In this case, that’s artichokes and truffles. Although awesome in their own right, the mellow flavors in artichokes and truffles can both get lost among gamier meats. 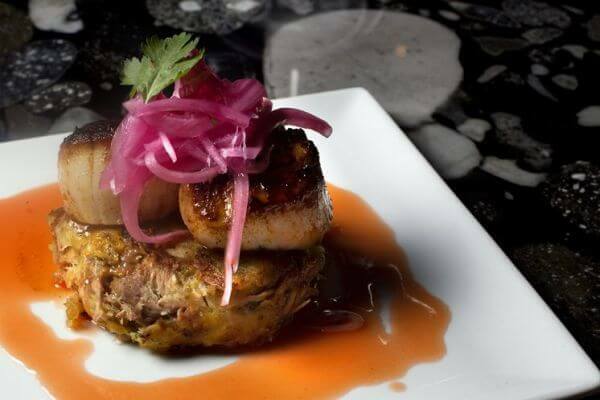 Here, instead of being overshadowed, they get to be the share the spotlight with scallops. 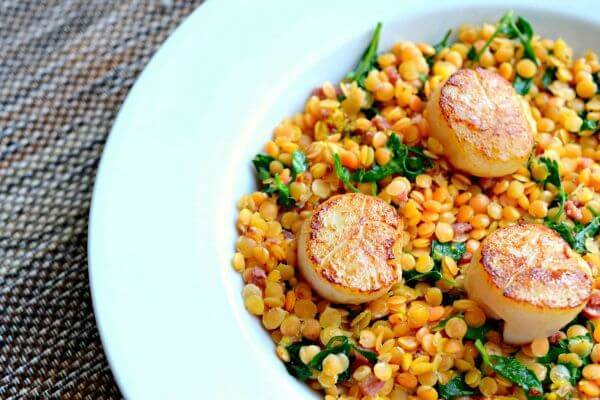 Because of their tender yet firm texture, scallops were practically made to go with a bean or lentil salad like this one. Don’t let the name salad mislead you. This one is hearty with not just red lentils but chorizo. The base flavors are complemented by diced apple, Dijon mustard, and a couple splashes of white wine. Eating clean is easy when you stick to a dinner of seafood and vegetables. And it’s easy to eat your seafood and veggies when they’re served in this mouthwatering package. 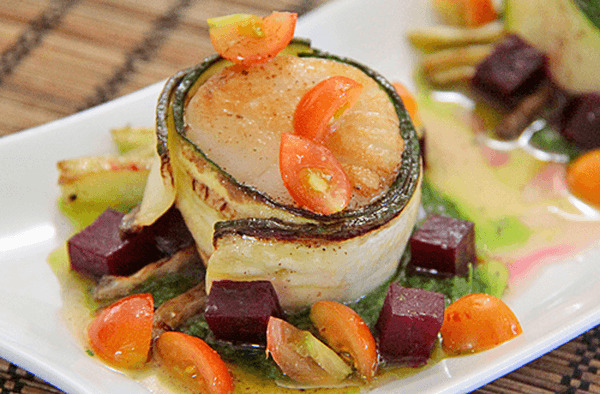 Scallops are often wrapped in bacon, but you can replace that with zucchini without sacrificing presentation. In fact, the plate is an eyeful of color with tomatoes, beets, and watercress. 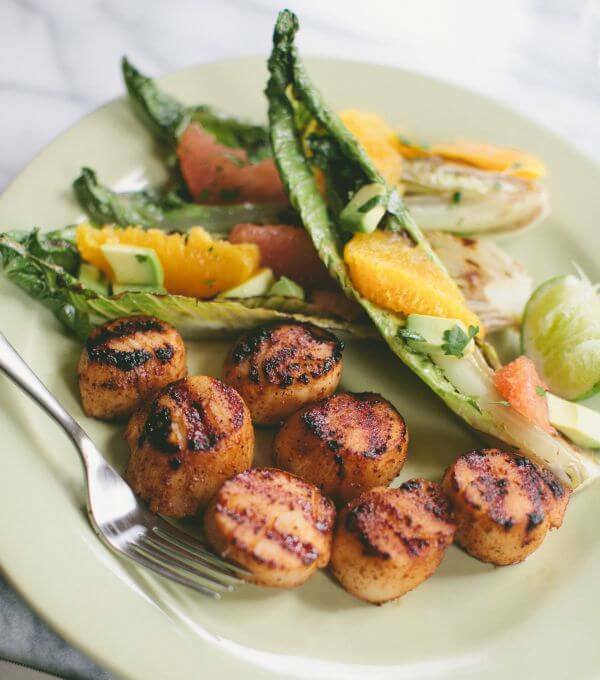 What did you think of these scallop recipes? Have anything else to share? Let me know in the comments below!